On 22 Oct, the pager beeped for a Chestnut Bunting on the small island of Papa Westray, Orkney on the previous day, but it hadn't been seen that day. Some photos emerged that produced further online speculation as to its actual identity: but the photos weren't great. Either way it seemed an academic discussion for most Birders (but not the finders obviously) as the Chestnut Bunting had been & gone. But on 24 Oct, the pager mega'ed to say it had been relocated a few hundred metres from where it was originally found. This prompted a number of Birders to explore ways of getting there for the next day: a Sunday. Having looked at the complexity of getting onto Papa Westray, which involved a drive to Northern Scotland to take the ferry to Orkney & then trying to get onto a charter flight onto the island: a long drive, complex logistics & very expensive. Had I not just had a few days on the Western Isles, I might have used it as an excuse to have a short break on the Orkneys. But after the concerns of its identification & with the previous eight records all on Cat E List (i.e. not tickable), I decided to stick with the committed plan of doing my WeBS count that afternoon. On 26 Oct, much better photos emerged of the Chestnut Bunting from the first mainland twitchers, both confirming the identity & that it was considered to be a First Winter male. I found more information about the previous records of Chestnut Buntings & why they had been placed in Cat E (see BOURC 37th Report). Six had been in May to July, which the BOU considered this was outside of the pattern for other accepted far Eastern vagrants. The other two records were in Sep, which the BOU considered were too early to have been genuine vagrants, based on their movements through Beidaihi (North China) & Hong Kong. Additionally, most individuals had been adults. The report also stated that First Winter individuals in Oct or Nov would be considered seriously. This was suddenly looking a lot more hopeful. If any record was going to get accepted onto the British List, then it should be this one. This was supported by a number of accepted records, or likely to be accepted records, scattered across the Western Palearctic, included a First Winter individual on Ouessant island on 25 Oct 14: the Brittany equivalent of the Scillies. At this point, I saw places on a charter from Yorkshire being offered on the pager for 28 Oct, which was still two days away. A few phone calls later, I was sixth on the list for the charter, but it was only a five seater plane, but there might be two planes. By the following afternoon, the Chestnut Bunting was still there & I was on the single plane that was going, as three of the people ahead of me on the queue had managed to get over a day earlier (thanks guys). I was all set to pick up two of the passengers over night on the way to Yorkshire. I met the plane organiser, Vaughan Watkins, another ex-Southampton Birder, who I hadn't seen for 28 years at Chieveley services on the A34. A couple of hours later, we were picking up Chris Gooddie, near Derby. After a good journey, we arrived with enough time to go & find a quick breakfast near the airfield. We had all agreed we weren't planning on leaving from Yorkshire, until we knew the Chestnut Bunting was still there. As I was driving the final few miles to the airfield from the cafe, Vaughan received a message from the incredibly helpful Paul Higson on Orkney, to say one of the local Birders on Papa Westray had been out at first light & it was still there. The message ended with "Scramble, Scramble, Scramble". A couple of minutes later, I was pulling into the airfield to see our other two companions, Matthew Deans & Mark Sutton, who had just heard the news. Our pilot was keen to get going, but was concerned we might not be able to land on Papa Westray, due to low cloud. The plan was to leave & see how the weather developed, with Plan B being a landing at Wick to wait & see, if the weather was poor. So all loaded we were quickly on our way. Fortunately, as we were flying, our pilot said the weather forecast for Orkney was improving & he planned to go straight to Papa Westray & see if we had enough visibility to get in. As we descended, we started to see the neighbouring island of Westray & then Papa Westray. All set for the landing, which went perfectly. We were asked if we saw the Chestnut Bunting if we could be back in a couple of hours as the blustery winds were due to increase to a Force 7 wind that afternoon. It was only a ten minute walk from the airstrip to the track which the Chestnut Bunting had been frequenting. No other Birders present, but we had been told to look at the end of the long track or walk around just into the field at the end. We got to the gate, but no sign from there. A good search in the field & no joy either after fifteen minutes of looking. Fortunately, Vaughan & Chris walked back up the track & found it grovelling in the grass at the edge of the track. I suspect we had walked too fast down the track & had managed to boot it without realising & it had then flown behind us on the track. Either way, we were soon all watching it in the grass at the edge of the track. By staying still or moving slowly, it was quite happy to feed in the grass about ten or fifteen metres from us. Despite, being fairly short grass, it was very adept at keeping out of sight or partially obscured. Eventually, it quickly crossed the central bare earth track, which allowed some photos in the open. A little later, it quickly walked back across the track. Finally, we carefully walked a bit closer so we were about eight metres away. As it was feeding on the edge of the track, it tended to move in one direction. Chris decided to take advantage of this & jumping the wall & then using it as cover, he moved to the far side of the Chestnut Bunting. The plan was he was going to slowly move it towards us, but it seemed more happy to feed & walk towards him. At one point, it stopped to have a drink from a small puddle on the track & then sat in the open for a minute or so. Soon after one of the islanders on a walk came past & it quickly flew onto the wall, before disappeared further along the track. As we had all had plenty of time to watch it & get photos, then we decided on a quick look around Hollard Farm on the way back to the plane. We had a refuelling stop at Wick both for the plane & with fish & chips (just chips for me) & about 2.5 hours later we were looking to land again in Yorkshire. Again there was a worry from the pilot as to whether we would be able to land, given there was a lot of mist in Yorkshire, but fortunately, it clear over the airfield (but with a fog bank only a mile beyond the airfield). Had we not been able to land, then it would have been a diversion to Teesside airport & a taxi back to our airfield. We were all relieved to be able to start the journey South again (& not to have had to go via Teesside airport). The Chestnut Bunting stayed for one more day & then disappeared after the first clear skies night for at least a week, when there was a clear out of Thrushes from the area. Further reading up has shown that Chestnut Buntings, in line with several other closely related species migrate in their juvenile plumage & then moult on their Wintering grounds. So I guess it is fairer to call it a juvenile male in its First Autumn, rather than a First Winter. Young Birds are prone to make navigational errors on their first migration, so that would look good for it being wild. The date looks good. I also saw a map of the breeding grounds for White's Thrushes & Chestnut Buntings & there was very good overlap. I'm sure few Birders doubted the authenticity of the White's Thrush that was found on Shetland on 23 Oct: just two days after the Chestnut Bunting was first seen. But obviously, there is a more established pattern of late Autumn White's Thrushes in the UK. Personally, I think if this Chestnut Bunting doesn't get accepted, then it will be hard to admit any records onto the UK List. But I also think the BOU have made a good analysis of the previous UK records & can't see any of them getting accepted after the event. One of the other factors affecting those records, was the species was being regularly imported into Europe up to about ten years ago, but apparently this trade has been stopped following the avian flu epidemic a few years ago. All the previous records were before the ban. It is interesting to see the usual band of naysayers on line pointing out how approachable this Chestnut Bunting was. Well it was happy to feed about ten metres away while we were there, but did quickly flush when the islander tried to walk close to it. I have seen a photo of somebody standing close to it, but certainly no closer than Birders have got to a number of other approachable Buntings in the past on the Northern Isles. But given its Cat E classification, I will be waiting to see if the BOU accept it as a Cat A vagrant before ticking it. I think the supporting evidence looks good, but will have to wait & see. In the meantime, it will go down as another of those memorable twitches in my books with a great bunch on the plane. Happy second birthday to the Blog. In keeping with last birthday, here are my favourite Posts from each of the thirteen months/part months over that last year. On the first Birding trip with the camera, two years ago I was lucky to photograph a Pallid Swift at Stanpit & later to see, but not photograph, a Pallas's Warbler at Studland. On the second birthday for the Blog it is perhaps fitting that I should see the other Eastern striped jewel, a Yellow-browed Warbler, feeding in my garden: only my second garden record after one heard last Autumn in a neighbour's garden. It is ironic that this Yellow-browed Warbler disappeared as I grabbed the camera. So I will start the first with the last Post in Oct of the one of the three Yellow-browed Warblers I saw at Studland last year. November was the most difficult month to select a single Post as I spent the first three weeks in the Pacific visiting Tahiti, Pitcairn, Henderson Island & the other uninhabited islands looking for Tuamotu Sandpipers & other endemic Pacific landbirds as well as a good selection of Seabirds. I still have a backlog of photos to sort through from the final week when I get time. It is very difficult to find a single Post that stands out beyond the others with some many great Birds, Cetaceans & Green Turtles seen, as well as, the visit to Pitcairn island. But I have narrowed it down to two great characters. I didn't get out Birding much in Dec until after Christmas when I started to watch Studland more. The clear Dorset highlight occurred on New Years Eve when I found a male Green-winged Teal at Brands Bay. It, along with an overwintering Great White Egret & an elusive Black Guillemot, were some of the reasons to spur me on to have a go at the Studland/Ballard patch Year List. Frustratingly, it didn't reappear in 2015 despite a lot of seaching on near every day in Jan.
With the last minute decision to go for a Studland/Ballard patch Year List then it is not surprising that the year will largely revolve around highlights of the patch. I managed to get out somewhere in the patch on all, but three, days of Jan. As a result, I had stunning start to the Year List with an end of Jan total of 123 BOU species. I also saw my first Butterfly of the year: a Peacock at Greenlands Farm on 16 Jan. My previous best patch Year List was 176 (BOU) in 2009. I set myself an ambitious target of 180 species & after seeing the Peacock, I set a second target of at least one Butterfly seen in each month of the year. Currently, the patch Year List is on 179 with over nine weeks before the end of the year. Additionally, I've seen at least one Butterfly in each month so far. I reckon it will be fairly easy to see a Nov Butterfly, but Dec will be the tricky month. One of the unexpected species that I saw in Jan on the patch was a Great Grey Shrike which was found by a local Birder on 24 Jan. I managed to see it that afternoon, but the views & photos weren't great. My third sighting was near Pilots Point after it shifted to the South Haven end of the Studland Peninisula. It was surprisingly approachable on this occasion. March is always a month when the first of the Spring migrants arrive & so it was great to see a couple of Black Redstarts on Ballard Down on the first weekend. The first migrants are few & far between, but always a sign that Birds are on the move & more will be on their way soon. April started off with more migrants on the patch & then out of the blue, news of the UK's second Great Blue Heron on St Mary's. It soon disappeared, but fortunately, was refound on Bryher. As a result, conditions for set for one of those memorable day trip twitches to Scillies with mates Peter Moore & Richard Webb. In May, I managed to join one of the Christchurch Natterjack Toad night walks. This was the only native Amphibian I had never seen. Fortunately, we we lucky to see four Natterjack Toads, as well as, large numbers of their tadpoles. A great evening out & a very informative leader. I would recommend the trip to anybody else who wanted to try & see this great species at its only Dorset site. By June, the patch had become very quiet as all the migrants were long gone & all the breeding species were well into their breeding seasons. But it was a hectic month for me at home as I had to empty the living room to allow the builder to lay a new floor, sort out damp problems & have some rewiring done while the room was being gutted. As a result, the appearance of a Cretzschmar's Bunting on Bardsey was worrying, but the prompt disappearance was good news, given the amount of emptying work I was doing around the house. I was more dismayed when the the Cretzschmar's Bunting reappeared & seemed to have settled down. The prospect of a long drive to North Wales with the uncertainty of whether I could even get on the boat over was not appealing. Then I heard the Ewan Urquhart was organising a charter over & there was a place on the boat for me, as he had had to defer the sailing due to bad weather. I cleared it with the boss to have a day off at short notice & it was game on for the second memorable twitch of the year. A great day that went perfectly with nice bonuses of a Thrift Clearwing, some playful Bottle-nosed Dolphins, local Seabirds & good companions on the charter. I had a short trip to Turkey planned while some of the work was going on in the living room as the house wasn't going to be habitable during the early part of the work. 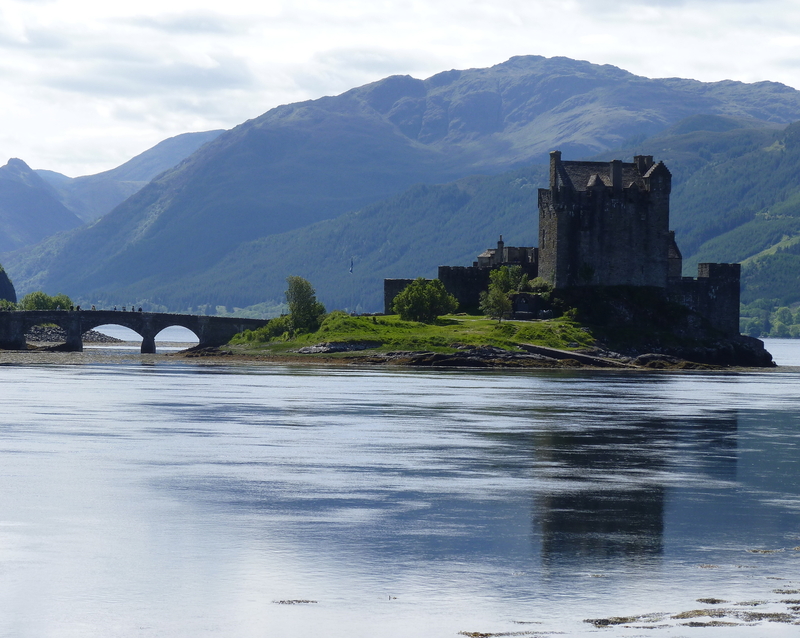 I've yet to write up most of the trip, but here is something to wet your appetite for when I do. Having successfully completed a six month contract in London, then I had the funds to allow myself to take the Autumn off & enjoy the Birding. Not surprisingly, this focused mainly on the Studland/Ballard patch. One of the highlights of the month occurred off the patch, when news of a Black Stork seen flying off from Arne, broke late in the afternoon. With little to go on local Birder, Nick Hopper, & I were quickly out looking to see if we could relocate it. After about thirty minutes of looking, I jammed into it as it flew out of the Wareham Channel area towards Middlebere. Less than ten local Birders managed to connect with it that evening, but those who got out early the following morning were able to enjoy it before it headed off West. Despite some great Birding on the Studland/Ballard patch, it was the Acadian Flycatcher twitch that will stand out for many, including myself, as the clear highlight of Sep. When the news broke it was an Empidonax Flycatcher sp. at Dungeness and it was a bit of a gamble about should I go or wait to see if there was a clearer idea of what species it might be. Had it been East Anglia, I might have waited on news, but Dunge was my old late teens stamping ground whenever there was a school holiday & I was quick to team up with local mate & ex-Kent Birder, Marcus Lawson, to go for it. Marcus did a sterling job of getting us cross country after a few problems with the roads that day, whilst examining the photos on twitter. His feelings of Acadian or Yellow-bellied Flycatcher were encouraging (especially as it wasn't an Alder Flycatcher) & after seeing it, we came home thinking Acadian was the most likely fit. Thanks to Martin Collinson (see 30 Sep 15 tweet), we now know if you have purple DNA/poo you might be an Acadian Flycatcher. The highlight of the first three weeks of Oct has to be the Wilson's Warbler twitch. 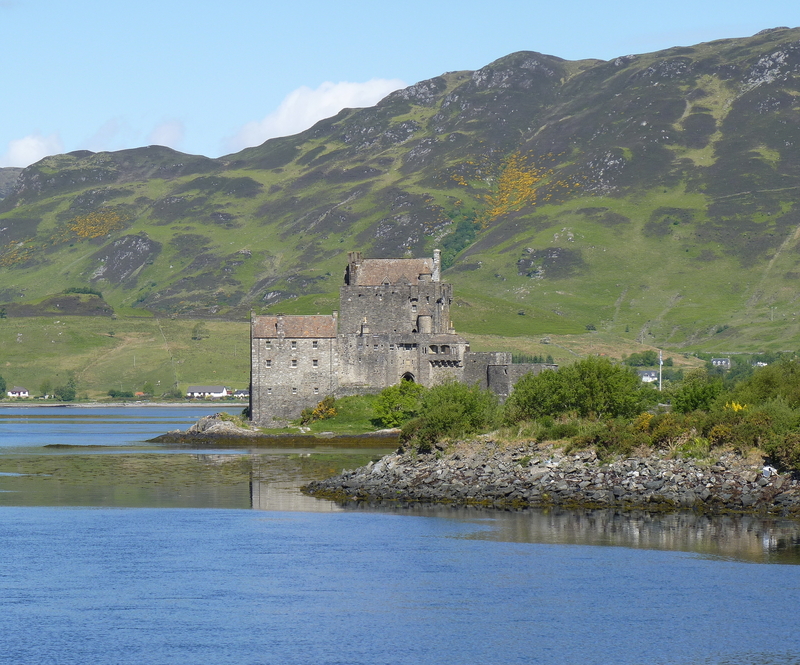 Another memorable island trip & my first visit to the island of Lewis & Harris. I'm sure it won't be my last. There is still more to appear on the follow on return visit to North Uist. I am pleased to see I passed the 100,000 hits on 11 Oct 15. So a big thank you for all the people following the Blog. I hope you have enjoyed it & the photos so far & will continue to look at & enjoy the Posts going forward. One of my favourite early 80s classics was New Order's Blue Monday. But today, I had a call from Sussex Butterfly mate, Neil Hulme, to say it was Blue Friday. This immediately got the alarm bells ringing. I was cooking some lunch at the time, but within fifteen minutes I had finished cooking, bolted down the food, grabbed the cameras & was walking out to the car. Next stop Beeding cement factory site, near Shoreham-by-sea. Guess I had better explain. Neil has been keeping a close eye out over the last few weeks for Long-tailed Blues hatching out. Earlier in the Autumn, there had been an arrival of Long-tailed Blues, a rare migratory European Butterfly, into Kent & Sussex. Neil had been checking the foodplant, Broad-leaved Everlasting Peas, at a number of locations & found a good number of eggs. After that it was a case of waiting to see if any of these hatched into Butterflies. Apparently, the caterpillars spend all their lives in the flowers & pea pods. As a result, it is unlikely that there will be any sightings after the eggs have hatched, until the Butterflies appear. It is only 110 miles & should have been no more than two hours drive, but it was a Friday afternoon leading into a half term & the roads were clogged at every point. As I got closer, I had several calls from Neil to confirm how close I was, as he was waiting to show me the roosting Long-tailed Blue. But he really needed to leave as he was taking his better half out that evening. Finally, I arrived & we had a quick chat & Neil was off, while I was left to photograph the Long-tailed Blue. I had chance to play around with the camera's built in flash, which I've hardly used in the two years of having the camera. But the light was fading as there was less than an hour of light left. Eventually, I was happy with the photos & left the Long-tailed Blue roosting. Glad to say it was seen on the next couple of days, although it did disappear after a male was seen. So perhaps some Butterfly hanky-panky & the female was heading South. In most Butterflies, I understand that males are likely to hatch out first, so they are ready for when the females emerge. But with the final brood of Long-tailed Blues, the first out are the females & they are waiting for a male to hatch. Once they have mated, it is believed the females will then leave the site & be heading South so the next batch of eggs will be laid in a more benign climate. 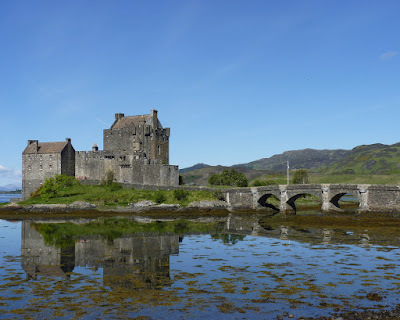 I've made a number of trips over the last decade to the Western Isles & the route nearly always takes me past my favourite Scottish castle: Eilean Donan Castle. It is just to the South of Kyle of Lochalsh, which is the town with the bridge to Isle of Skye. Apparently, the first fortified castle was built in the mid 13th century with four subsequent major rebuilds to it. 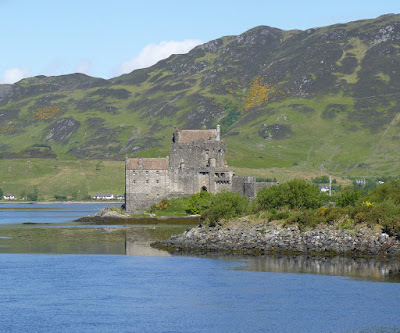 It was partially destroyed during the Jacobite uprising in 1719 & was left as a ruin, until the castle & island was bought in 1911 & the castle was rebuilt. It is now open to the public from Feb to Dec. More information of the castle's history can be found here. After the day on Berneray & North Uist, I caught the mid afternoon ferry back to Uig, Skye. Ideally, I would have had another day on North Uist, but I couldn't get reservation on the ferry for the car on the 18 Oct. It was very quiet on deck with small numbers of Gannets, Guillemots & Kittiwakes and a couple of Razorbills. Then I picked up a party of about twelve Dolphins coming for the ship. I was pleased to see they were Common Dolphins, rather than Bottle-nosed Dolphins: which are the more regular UK species. They put on a great display including jumping out of the water on some occasions. Unfortunately, we were moving too fast & they failed to catch us. All too quickly they gave up. As we got closer to Skye, I saw another pair of Common Dolphins. I am always happy to see Cetaceans of any species, but the first pod of Common Dolphins put on the best display that I've ever seen in UK waters. Finally, the headland close to Uig came into sight & we were only a few minutes away from docking. Time to head down to the car deck. I ended up heading for the Loch Garton area & spent a couple of hours driving back roads hoping to bump into a Pine Martin, but had no joy. The following day started off dull & miserable and after a quick look around, I decided I had had a great trip to the Western Isles & would start the long trek home.